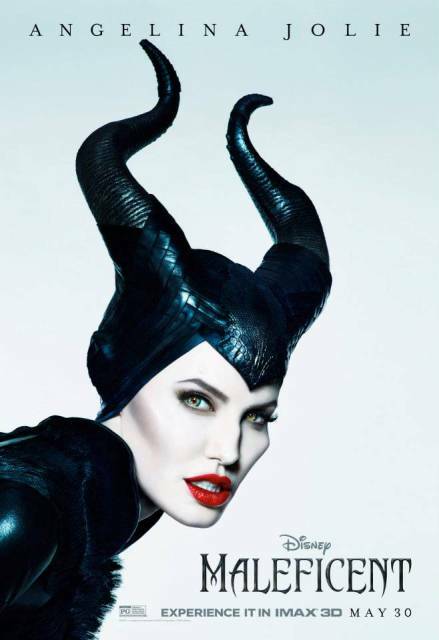 Have you been anticipating to see “Maleficent” since you saw Angelina Jolie’s pictures as the character? I know I have. One look at her pale, chiseled face, the eyes that were as sharp as her cheekbones, red lips, and those horns– got me hooked instantly. After watching the movie, are you also one of those who felt somewhat disappointed at the movie itself? I know I am. This in spite of finding many reasons to like it. Probably one of the reasons why I was disappointed with “Maleficent” was because I really loved the character from the animated Disney film. Looking at the character then, I had the feeling that she had an interesting back story, that her villainy had a profound reason. Of course, Angelina Jolie is the sole reason for this movie’s being. And she embodies this importance as breezily as she did when she played Lara Croft. The trailer deliciously hinted at the playful malevolence of her character but for the duration of the movie, she was just reacting to a betrayal in a self-destructive way, much like the rest of us mere mortals when we have been spurned by our lovers. A big softie hiding inside that angular exterior. In short, the script turned her insecure and petty, which didn’t fit her character. Princess Aurora (Elle Fanning) was kind of a bumbling princess, most probably taking after the bumbling pixies who raised her. Imelda Staunton, as the lead pixie Knotgrass, was wasted in her role. Emma Thompson and Dame Judi Dench, said to be considered for the role of the pixies, must be glad they stayed away. The three pixies were like female versions of the Three Stoogees. And I kept on thinking that Nova Villa, Debraliz, and Gretchen Barretto gave better performances as the fairies in the Sleeping Beauty segment of the trilogy “Mga Kuwento ni Lola Basyang” (1985). Diaval (Sam Riley) had the best story arc in this film. At the onset, he was bound to Maleficent but he gradually evolved and became Maleficent’s conscience. Kind of like Jiminy Cricket to Pinocchio. Plus, he got to be a dragon. I was actually looking forward to Maleficent transforming into a dragon but she didn’t. Another disappointment for me. “Maleficent” was directed by Robert Stromberg, a production designer who won Oscars for “Avatar” and “Alice in Wonderland”. This would probably explain why the movie’s visuals is a great delight. This I am glad to admit. Every frame of the movie is such a pleasure to look at because it’s so beautifully imagined and rendered to life. Even the ‘monsters’ are pretty in their own way. I could watch Angelina Jolie just roaming this environment for hours and I wouldn’t complain. Another thing I liked about the movie is getting Lana Del Rey to sing the old theme. That was a clever call. Her rendition was perfect for the movie I imagined–dark and haunting. Angelina Jolie said in an interview that she’s happy to have done a movie that she can watch with her children. And it’s true, children will be delighted to see this movie. In fact, one of her kids is IN the movie, as the toddler Aurora. I just wish they didn’t treat the adults who will watch this movie with the kids with disregard. The movie left me wishing for a less muddled directing, more interesting characters, and a more coherent plot that would rightfully engage me the viewer. I love Angelina Jolie, but she alone doesn’t a movie make. To escape the heat of the day, my aunt and I went to the mall. We hoped to catch a movie but found the selection wanting. We weren’t in the mood for Sarah and John Lloyd, so we turned to ‘The Croods’. I didn’t see the trailer of this animated film; the poster suggested a reboot of ‘The Flintstones’ or a human version of ‘Ice Age’. My anticipation rose a few notches when I saw the director was one of the guys behind ‘How to Train Your Dragon’. So with little expectation (other than to enjoy some air conditioning), we entered the cinema. An hour and a half later, we emerged from the cinema with smiles on our faces. We were entertained. Visually, there was really nothing to complain about. The scenery was lush–the jungle was an obvious nod to ‘Avatar’ while the hybrid fauna looked like plush toys in my mind already. The rendering of the many kinds of light (sun, moon, fire) against textures of hair and skin was fantastic. However, in terms of story-telling, the film utilized quite a ‘primitive’ approach. The characters are stock and the narrative elements do not seem to meld together. Even the voices of the characters didn’t register as done by big film stars, except for Gran’s voice–I deduced it was Cloris Leachman after a few lines. (I mean I had to Google the voice talents of this film, and was quite surprised to learn that Nicholas Cage voiced the father. Wow, I thought, he hadn’t acted like that in a long time!) Fortunately, these shortcomings were easily upstaged by the brisk pacing, and the right combination of slapstick and pop culture-skewing humor. My favorite character: Belt. Contrary to other’s opinions, I found the running gag of pesky mother-in-law very funny and entertaining. Maybe because I grew up watching ‘John & Marsha’, I’m not sure. 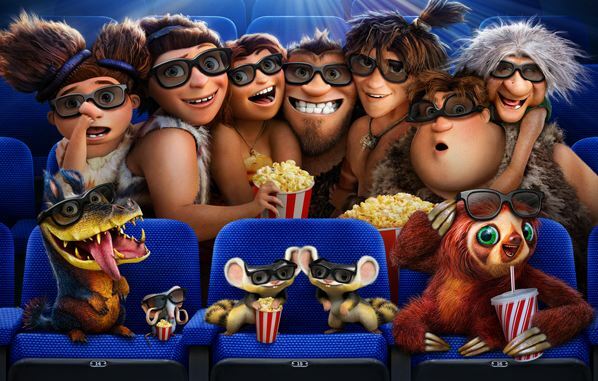 Over-all, ‘The Croods’ is a funny and touching film that entertained me immensely, and for its young audience, it imparts a sweet message about the importance of family to one’s life, and the importance of embracing–not fearing change.